No doubt, this guy Biden gets a bit tongue-tied. Two big flubs in his speech last night - calling McCain "George" (though that worked) and his line about Republicans taxing corporations (he meant tax cuts, and it didn't work). But could this be yet another masterstroke from the Obama team? I think it might - and if they could script the flubs, they would. 1. Contrast and defuse the claim that Obama is all polish. 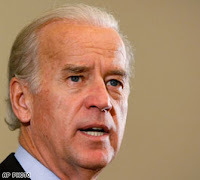 Biden is the non-polish that ruffs up the Obama patina. 2. Yes, as everyone has said, Biden talks to the blue-collar where Obama speaks the language of the post-grad. The blue collar don't need things expressed flawlessly: they get the point. Even when he's making a flub - maybe even more when he does - Biden's point is clear. 3. Allows Biden the opportunity to get in more off-the-cuff digs and have them hit home. A guy who sounds unscripted is more likely to be taken seriously. 4. Endear him to voters. The guy seems human, and a little nervous, like them. Add that to his emotional backstory, and he's the most easily humanized candidate in this campaign (a great contrast to the Robotic Romney, should he be the opponent). 5. Lowers expectations and fakes out the other side. Biden may flub a few lines, but he's on when he needs to be. His critique of McCain's foreign policy was eviscerating: and delivered flawlessly. So if camp Obama tells Biden not to take any public speaking lessons, don't be surprised. His gaffes are a gift. Choosing Palin: Gutsy or Reckless? McCain Picks Token Woman: Will It Play? Obama's Acceptance Speech: Did It Work? McCain's Second Fiddle: Convention Fatigue? Could It Be Clinton After All? Is Hillary McCain's VP Choice? Will Clinton Release Her Delegates to Obama? Olympic Ratings Up - But Why? What's with the Timing of the Penn Memos?